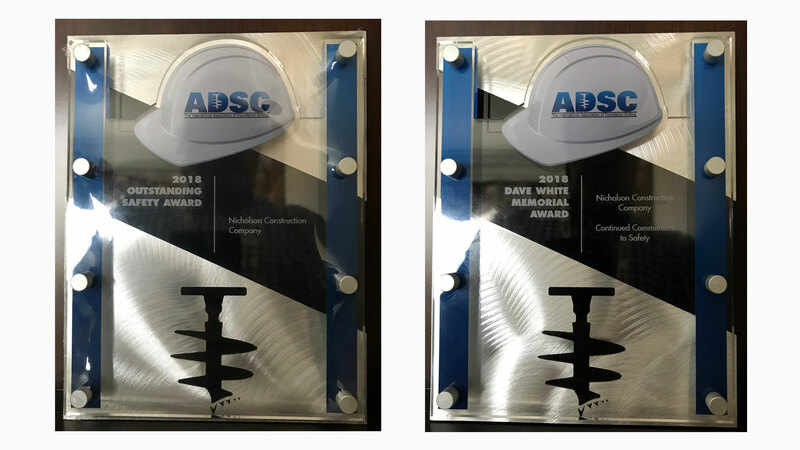 PITTSBURGH– July 12, 2018 – Geotechnical general contractor and Association of Drilled Shaft Contractors (ADSC) member Nicholson Construction recently received the ADSC’S Dave White Memorial Award for Continued Commitment to Safety. The award is given to member contractors who successfully execute company-wide safety programs in an effort to prioritize and improve overall safety performance. Nicholson’s Safety Through Everyone’s Participation (STEP Up) Program, which was launched in 2014, has had an extremely positive impact on the company’s safety culture and safety record. The efforts of the STEP Up program have led to some of the lowest statistics for work-related injuries and lost-time work days in the company’s history. The Dave White Memorial Award was instituted by the ADSC in honor of the organization’s first Safety Committee Director. Nicholson received the award, along with the Outstanding Safety Award for 500,000 – 750,000 hours worked, at the ADSC’s summer meeting. Nicholson has been both a leader and an innovator in the geotechnical construction industry for more than 60 years. With regional offices across the country and headquarters located in Pittsburgh, Nicholson is a nationally renowned specialty contractor, offering proven expertise in the design and installation of deep foundation elements, earth retention systems and ground treatment solutions. We pride ourselves on our ability to consistently provide our clients with innovative, high-quality design-build options for projects of varying size and complexity. Nicholson is the North American subsidiary of Soletanche Bachy, one of the world's leading geotechnical contractors, and is part of a global network of unparalleled geotechnical resources and expertise. Sign up to receive "Nicholson News" - our quarterly newsletter. Oops! Something went wrong while submitting the form. Please try your submission again. Apply now to become a member of our diverse and talented team.